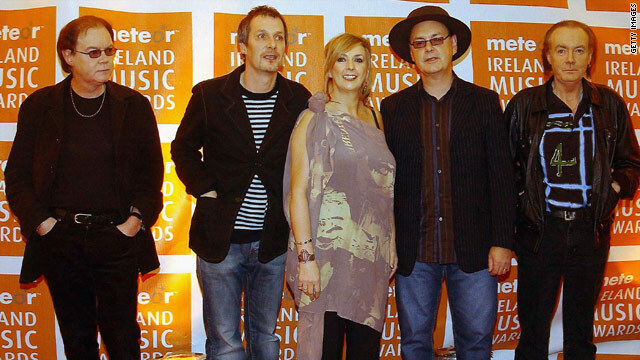 Moya Brennan (center, with Clannad) is hosting a special on Irish music. Irish music wasn't always so popular, she says: was once considered "poor man's music"
New York (CNN) -- The fiddles and bagpipes are playing Irish music all over the country on Wednesday, St. Patrick's Day, but there's more to the songs from the Emerald Isle than renditions of "Danny Boy" once a year. "Music is to the Irish what sports are to [Americans]," says Irish star and Grammy winner Moya Brennan. And she knows what she's talking about. Brennan's been called the "first lady of Celtic music." She's also the host of a new documentary called "Music of Ireland -- Welcome Home," which is available on DVD and appearing on PBS stations around the country (check your local listings). It's the passion in the music that makes it so popular, says Brennan -- which, she adds, wasn't always the case. Decades ago, Irish music wasn't popular, even in Ireland. "It was regarded as poor man's music," says Brennan, and "people were ashamed" of it. But now she says "there is a real surge of respect from even young people towards music in Ireland." As one of nine children, Brennan says that she can't imagine her life without music. Her talented family -- you may have heard of her younger sister Enya -- grew up playing and singing. She first became a professional performing with Clannad, a group made up of family, in 1970, and she's been a player on the island's music scene ever since. So when time came for Brennan to interview a long list of Irish stars, including Bono, Sinead O'Connor and Bob Geldof, she'd known most of them for years. The stars come out on the documentary to do more than just focus on ballads and history. "It is music from all genres from the Clancys to U2," says Brennan. It's important to appreciate how the ballads of yesterday have been transformed into modern punk rock anthems by groups such as the Pogues, she adds. "If the music is strong, the root is strong, you won't lose out on it, and that's the most important thing with Irish music. There's so many aspects," she explains. "You've got the ballads and the Pogues kind of thing. There's a strong root there and an amazing tree and you can have so many branches coming from this tree, it's got so much variety. You've got the Chieftains, you got Riverdancing, you've got Celtic Woman, you've got the [Irish] Tenors, you've got Clannad, and this is from the same, kind of small, island. It's really incredible." A follow-up to the first hour of the program is planned and will focus on some modern artists such as U2, the Cranberries and the Corrs.